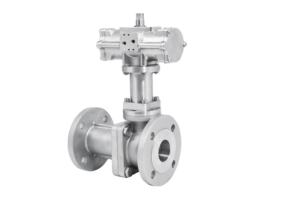 Since some months, as results of a long research and testing activity, OMAL has a new product in its hand: a new stainless steel flanged ball valve Series properly developed for the German Chemical Applications and Regulations. Everyone knows that German Industry has strict regulations and norms that manufacturers must carefully fulfil in order to be approved on different applications. The German “Chemie” requires for example valves to be in compliance with “AD2000 Merkblatt” for the choice of materials and sub-supplier. Another important mandatory norm for Approval in Chemical application is “PAS1085” – a regulation developed by four big players of Chemical industry and released few years ago – that contains requirements regarding design and performance. But this was not enough for OMAL. In line with the company philosophy of added-value and with the research of the best quality and performance, the decision was that AD2000 and PAS1085 were “only” the starting point of the development and so an additional directive was immediately considered: IGR Guideline Technik 12-00042-1. 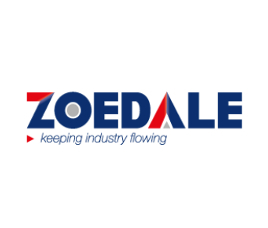 This guideline – together with a several number of different data-sheets – is an important Standard created by an association composed by some of the most important companies in Chemical sectors. OMAL chose four of the available IGR data-sheets (Form-Nr. 19021, 19022, 19023 and 19043) for the development of PROCHEMIE 60. 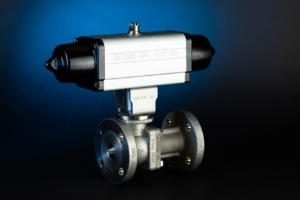 One of the most important requirement of these data-sheets refers to the sealing-capability towards the atmosphere: the valve must no leak through the stem after 60.000 cycles under TA-Luft Fugitive Emission condition. The biggest difficulty to face during the project study was to find a solution that had allowed the valve be tight also when intercepting the helium, the media requested by VDI norm for the testing. Helium is a gas has composed with one of the smallest molecule in the universe: just to give you an idea – under test condition – the estimated leakage admitted in the atmosphere per year is less than 0,5 gram of helium! And so, after a long and careful development activity this result was reached and the valve was certified under TA-LUFT Fugitive Emission: also the name of this new valve “PRO-CHEMIE 60” wants to highlight in fact that this PROfessional valve is dedicate to CHEMIcal applications and can reach these 60.000 cycles. The activities of research and testing were performed in OMAL buildings (in line with “In-house process” strategy), as the company invested on all test benches needed and on employees training: OMAL engineers are indeed qualified to perform the testing procedures. All these results were then confirmed and officialised by Authorized Third Party; in the same way the compliance to IGR-directives (chosen data-sheets) of OMAL ball valve sampling was confirmed by a Third Party directly located in Höchst Chempark in Frankfurt. Let’s talk now about some characteristics of this product. 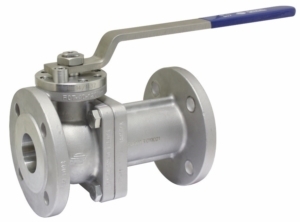 These new ball valves, that have as standard antistatic device EN 12662-2, and are fire-safe Iso10497/api607 certified, are of course in stainless steel for all components: 1.4408 for the body, 1.4404/316SS for the stem and the ball in 1.4408/CF8M. The valve is available with soft seats in PTFE+glass, as catalogue configuration, but of course other sealing materials are available on request, like TFM1600, PTFE+graphite or PEEK. Depending on the application condition needs, additional features can be proposed from OMAL Sales and R&D Team, like for example monodirectional construction (in case of fluid-overpressure risk inside the body) or stem extension in simple-welding construction or with double-sealing system (in case for example of low or high temperature) . But let’s go back to the certification Fugitive Emission UNI EN ISO 15848-1 and TA-LUFT 60.000 cycle: this result was in fact possible only after a careful study and development, in particular of the stem section. Starting in fact from the already very good stem sealing construction of OMAL MAGNUM and THOR ball valve Series, further improvement have been in introduced: to reach 60.000 cycles on TA-LUFT test VDI2440 condition (max leak 6,47 x 10-6 mBar l/s) is not easy. The V-packing sealing geometry in TFM1600 of MAGNUM and THOR have been kept in the design, but we have added a second sealing chamber through and additional bushing in Devlon and everything is preloaded by a stainless steel cover. The new very important feature of PROCHEMIE is that the seals are completely independent from the shaft rotation, in order not to be subjected to radial wear and to allow a very long durability keeping all sealing performance during the valve life. The upper cover (not-in-pressure component) packs in fact the springs that are acting on the V-packing through the gland nut ring and that allow the sealing to self adapt to the shaft granting the tightness, but suffering basically no radial frictions at all. Also the lower part of the stem, the anti-friction sealing washers are either receiving very low stress, as there is not pre-loading coming from screwing or nuts. This construction, composed with all these elements allows also to avoid the need of o-ring that in fact is not present in PROCHEMIE design. 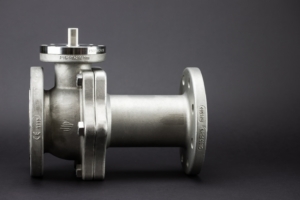 It is important to highlight that even if the valve is using an “upper cover”, the anti-blowout system of the shaft is anyway granted through the mechanical stop of the valve geometry (the stem is assembled from the inside body). 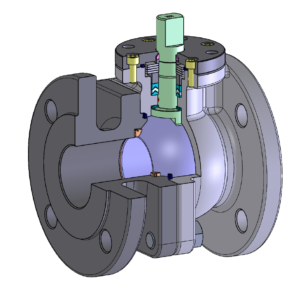 Furthermore, in order not to stress the upper-cover in case of actuator assembly, passing-through holes are present so that the actuator is directly fixed to valve body. You can choose the manual version that express reliability at top level, or let PROCHEMIE60 be automated using OMAL scotch-yoke actuator in aluminium or stainless steel body (mounting kit is as standard always in stainless steel) in order to benefit from the long-lasting high performance of the complete OMAL package, available with SIL3 certificates. This Series is available from DN15 to DN150 in short (F4 Face to Face) or long pattern (F1 Face to Face) in PN16/40 (EN 1092-1) with double acting, spring return, with or without integrated handwheel pneumatic actuator.